This 606-word sample post was crafted by Verblio writer Jessica M., who is currently a PhD student in political science at a top 25 research university in the Midwest. Prior to focusing on her education, Jessica spent a decade in the travel industry as an airline employee and as a travel agent. Additionally, she has published dozens of travel articles with sites such as USAToday.com. Jessica has traveled extensively and continues to do so for leisure and research. Her continued wanderlust motivates her to write travel-related articles to relive her spectacular travel experiences or plan new ones. At Verblio, our talented and well-traveled writers can help you create compelling content for your travel based business. Nestled in the foothills of Spain’s Sierra Nevada mountain range, Granada remains a national treasure that draws millions of visitors each year. 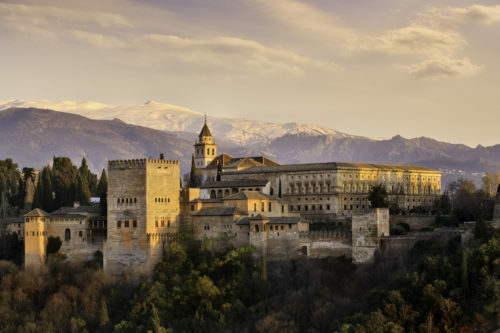 Located in the heart of Spain’s Andalucia region, Granada lies about an hour from the beaches of the Mediterranean Sea and under 45 minutes from mountain ski slopes, making it the perfect year-round vacation destination. Whether it’s your first or fifth visit to Granada, you need to visit the Alhambra at least once. Even those who aren’t history buffs or don’t get excited about architecture will appreciate the magnificent compound. Alhambra’s genesis as a small fortress occurred in the 9th century, but came into its glory in the middle of the 19th century when Muslim emirs of the Nasrid Dynasty rebuilt the fortress and added the palace and gardens. Only 6,000 visitors may enter Alhambra each day, so entrance tickets sell out. You can purchase your tickets ahead of time here. Even if you visit during the winter months, you can get a sense of the picturesque gardens next to Alhambra; but, for the most beautiful display, visit the Generalife Gardens when the flora is in full bloom. Generalife is one of the only remaining and best preserved examples of Moorish gardens in Spain, which originally served as a place of rest for the emirs and sultans who lived at the palace. You can include admission to the gardens with your Alhambra ticket and easily add an extra hour of exploration onto your visit. The Albaicín is the Moorish Quarter of Granada built during Muslim rule of the Iberian Peninsula. The area still maintains the white architecture and narrow streets characteristic of that time period. Locals and visitors alike flock to the Mirador de San Nicolas for the best views of the Alhambra from across the River Darrow. Although you can wander the streets during the day and find divine cafes and the Arab Baths, nighttime views should not be missed. A visit to the Albaicín pairs well with an outing to a flamenco show in nearby Sacramonte, the home of the gypsy (gitano) community in Granada. Most travelers know that a trip to Spain means enjoying a glass of sangria, wine, or beer with some tapas, small appetizers or snacks, but Granada is one of the few locales that offers free tapas. You might find that some of the more touristy areas of the city may charge for tapas, but the majority of tapas bars and bodegas bring you a free snack with each drink that you order. Granada’s centrally located Realejo neighborhood is famous for its great tapas bars. This also gives you an opportunity to mingle with the locals. Enhance your stay in Granada by staying with us at the centrally located Hotel Serena. Our boutique hotel offers 30 spacious and well-appointed rooms for travelers who prefer luxury accommodations. We invite you to book online here and let us know about any special requests that you have. If you are currently staying with us, please contact our concierge for questions and recommendations. We remain dedicated to ensuring that our guests have a wonderful stay in Granada.